Misery is over! Kiss hillbilly music good-bye! Les Garçons, that's Merten, Ben, Benedikt and Ben. "Dandybeat", that's what they call their unmistakable style of roaring guitars, elegant wardrobe, Playmobil haircuts and down-to-earth poetry. Their songs tell you what's up in Hamburg's bars, beds and between those two. The lyrics are pointedly ironic, not exactly the kind of thing you would readily expect of a german band. The influences of Les Garçons cover everything from Brion Wilson's strokes of genius to the sweet soul music that was shaking the dancefloors back in '63. It seems that you have to understand the old masters if you want to do something genuinely new. And that's exactly what Les Garçons do. In november / december 2000 the lads toured Germany with their debut single "Parklied". Delighted crowds and girls in love is what they left behind. I've seen them rock the crowd, so I can tell. 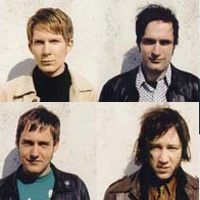 In summer 2001 their debut album appeared on Apricot records. Their latest album appeared August 2003! This ain't no retro! This is no fake! This is Les Garçons, s'il vous plait!